Specialists of the Central Institute of Aviation Motors (CIAM, a subsidiary of the National Research Senter ‘Zhukovsky Institute’) took part in the 14th Photonics — World of Lasers and Optics Exhibition which took place 4-7 March 2019 in Moscow. The event brought together around 200 key laser and optics manufacturers, research institutes and universities from Russia, Austria, Belarus, China, Finland, Germany, Japan, Lithuania, Singapore, South Korea, Sweden, Switzerland, USA. CIAM featured its exhibits on the exhibition stand of CameraIQ, one of the leading distributors of cameras and imaging systems for machine vision and research in Russia. The Institute presented an extra-power industrial liquid-cooled lighting system consisting of compact modular LED free-form luminaires with variable density of luminous flux. The brightness of a module when operating in continuous mode is 512,000 lm, while in pulsed mode it amounts to 1,536,000 lm. For comparison: a conventional incandescent 100 W lamp emits approximately 1300 lm. The liquid cooling technology used by CIAM allows the device to operate at elevated temperatures – up to + 500 ° C. The modular design of arbitrary geometry and compatibility with any lenses and reflectors make it possible to tailor the necessary scattering angles. 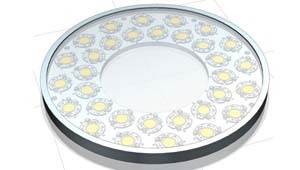 As of today, in terms of luminous flux and technical characteristics, the system developed by CIAM has no analogues in the world. The lamp is designed to work in difficult operating conditions (vacuum, high ambient temperatures) with high requirements for compactness and surface density of the light flux. The system can be used for the purposes of high-speed shooting in testing laboratories, at industrial and transport facilities. Source: Central Institute of Aviation Motors (CIAM).